The Simpsons are giving you the chance to make your friends 'yellow' with envy. 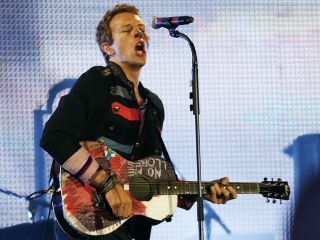 That's the idea behind a contest in which fans are being asked to design a character for an episode featuring Coldplay's Chris Martin as guest star. In the episode, set to air in early 2010, Martin will appear in animated form in which Homer disappoints his wife by arriving late to a wedding after stopping to buy a lottery ticket. Apparently, he bumps into the Coldplay star in the town of Springfield. The contest, part of the Fox show's 20th-anniversary celebration, is for those 18 and older, and runs until Friday, 11:59pm EDT 24 October. Submissions can be made online to TheSimpsons.com/character. According to the show's executive producer, Al Jean, who will be a judge along with series creator, Matt Groening, the character should be "pithy and funny." Jean also specified that the character should be a human being, with a typical Simpsons overbite and be yellow or with a hue found in the universe of Springfield. Those who enter the contest should describe their character's traits, name or nickname; age; appearance (again, human); occupation and catch phrases. The winner gets a trip to Los Angeles to work with producers and the show's animation director. The top entry will be announced in mid-November.